After setting up your outputs correctly, you can control how your content is distributed over these outputs using the Input Selection. The Input Selection stage shows a preview of your composition output. On the left hand, it shows all active screens. You can read more about screens in the previous chapter. Each screen can have one or more slices. To get your head around Input Selection and slices, think of your composition as the pie and your slices as, well, slices of that pie. By defining a slice, you can control what output will get which parts of your pie. For instance, you can define that the left hand side of the composition will always go the projector on output 1, and the right hand side should go to the projector on output 2. But you're not limited to dividing it vertically, or even halfway. 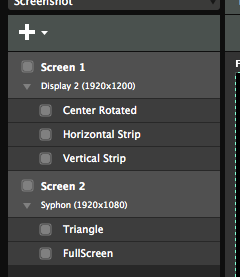 You can select any part of the composition you want to account for different output resolutions and aspect ratios. You are not limited to a single slice per screen. You can create as many slices as you like via the plus+ menu. The sky is the limit. Ummm. Actually. There is a limit. You can't create more than 1152921504606846975 slices. Of course your computer will run out of resources far before that, but on a computer with infinite RAM and infinite processing power, you could create one slice every second for the coming 36558 million years. Or create 151 million slices for each person living on Earth right now. Or if you got a penny for every slice, you could buy Star Wars back from Disney, 2.5 million times. When you open the Advanced Output, it always has one screen with one slice pre-made. You select this slice by clicking it on the left hand side. You can then resize it and drag it around on the Input Selection stage. You can scale, position or rotate the slice simply by dragging. Rotating the input is very useful for working with rotated LED panels. Tip! Slices will snap to the stage edges, the center and to each other. You can temporarily disable snapping by holding down CTRL. You can also type precise numbers into the boxes at the right. This is useful if you need the output to show a precise part of the composition. Tip! You can use math to let Resolume do calculations for you. Verrrry handy! Let's say you want to make a slice exactly a third of its width, all you need to do is type ”/3” after the width setting and press return. Also you can nudge slices 1 pixel at a time by using the arrow keys. Hold down Shift when pressing the keys to nudge them 10 pixels at a time. Right clicking a slice, either in the list or on the stage, will reveal a drop down with some useful presets and actions. Check the complete list on the Modifiers and Shortcuts page. Tip! One interesting option is Match Output Shape. This will let the slice take the position and shape that it has on the Output Transformation stage. This way you can quickly match the aspect ratio and positioning for pixel perfect pixelmaps. You can create as many slices as you like. You can duplicate an existing one or create new ones via plus+ menu. Also you can move slices between screens. Simply drag and drop them to the desired screen. Note that a screen should always contain at least one slice, so Resolume will stop you when you try to drag the last slice to another screen. Slice masks are available on Resolume Arena only! Slice masks can be used to further narrow down the shape of your slice. For all its options, a regular slice is limited to a rectangular shape. By using slice masks, you can define exactly which part of the rectangle you want to see in your output. To create a slice mask, click on any of the preset options on the right hand side of the Input Selection screen. You can also click on the pencil to create a completely freeform mask. You can invert a mask to make it a crop and vice versa. By toggling the Invert button on the right hand side, you can either show everything inside the mask, or everything outside it. After you have created the mask, you will notice two options in the top right of the Input Selection stage: Transform and Edit Points. In Transform mode, you can move the slice mask around like a regular slice. You have the same options for scaling, positioning and rotating. Be careful not to move the slice mask completely out of the slice, because this will result in empty output. We know less is more, but that's maybe a bit too minimal. Tip! When using a mask to create a specific shape for mapping, it helps to create your slice at the same scale as the shape you intend to use. As opposed to cutting out a small part of a big slice. 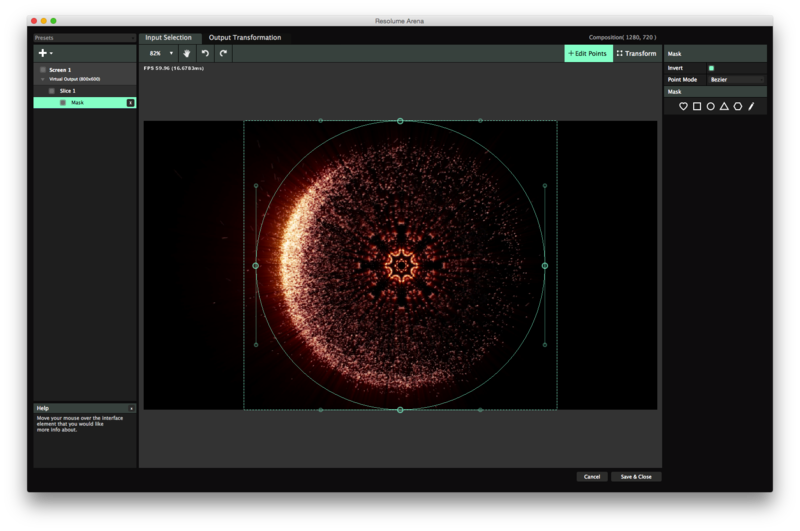 Resolume will still warp the slice based on the corner points of the slice, not the corner points of the mask. In Edit Points mode, you can edit the individual points of the slice mask. You can move points around by dragging or nudging them into position with the arrow keys. You can add points to the shape by double clicking anywhere on its path. Double click on an existing point to remove it. Here you can also switch the mask between linear and bezier. Linear draws exact straight lines between the points, bezier lets you draw nicely curved lines. In bezier mode, the point handles will be round. Each point will get two bezier handles, that you can use to curve the shape to your liking. 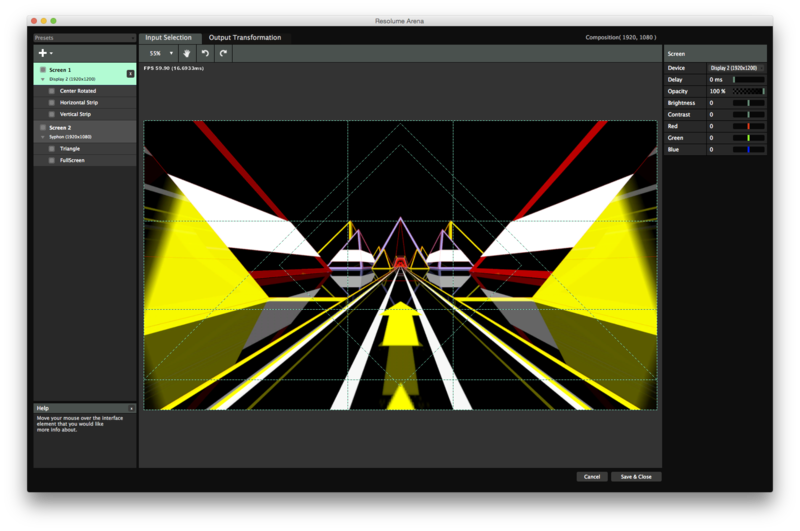 Polygon slices are available on Resolume Arena only! If you want the ultimate control over the shape of your slice, poly slices are the way to go. Poly slices will give you complete freedom on the shape and control points of your slice. Triangles, hexagons, stars or complete freeform, it's all possible with a poly slice. You create a poly slice via the plus+ menu. 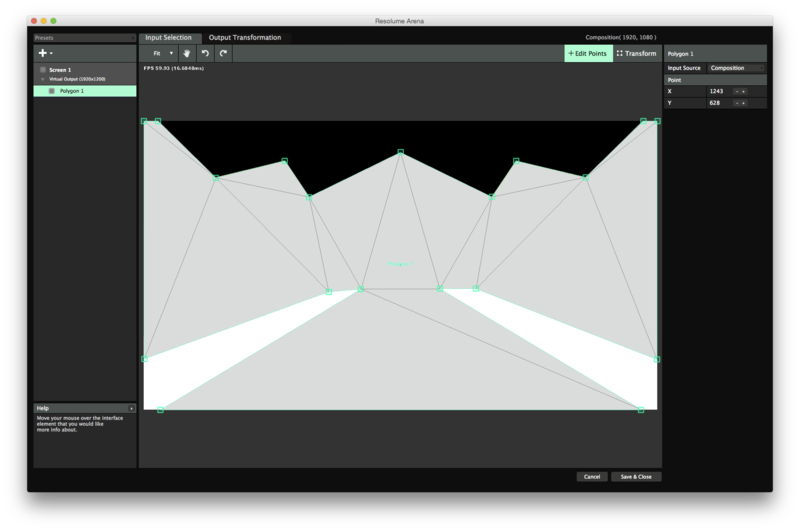 You can either create a preset triangle or draw a freehand polygon by drawing it on the stage. When drawing a poly slice directly on the stage, start by clicking where you would like your first control point to be. Now keep clicking around your shape, placing a control point in every corner. When you're done, just click on the start point or double click anywhere to close the shape. 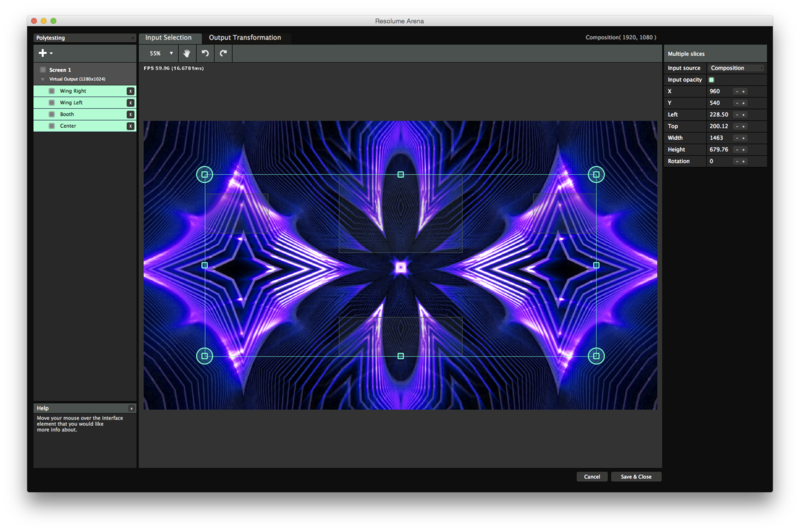 Once you have created your poly slice, Resolume will triangulate it for you. The same control points that you have set in the Input Selection stage will be available in the Output Transformation stage as well. Keep in mind that it's possible to create a shape that's not 'triangulatable', for instance by creating a shape that crosses its own path. In cases like this, Resolume will draw the outline in red. This is to let you know what you're trying to do is mathematically impossible in this part of reality. 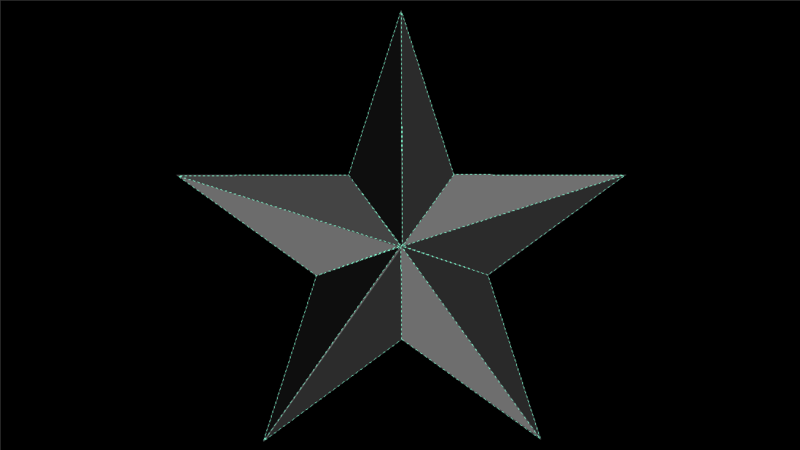 For the same reason, bezier points are not available on poly slices. After you have created your poly slice, you can still modify its scale, rotation and position in Transform mode. In this mode, the poly slice behaves like a regular slice. In Edit Points mode, you can still add and remove individual points as well as change their position. 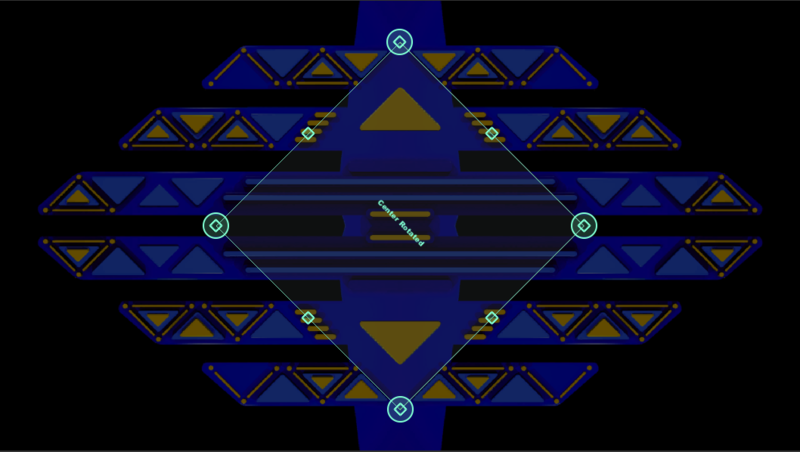 In this mode, the poly slice behaves like a mask. You can move, scale and rotate multiple slices at the same time. Drag around a group of slices on the stage to lasso them together. You can also shift click individual slices, either in the list or directly on the stage to add or remove them from the selection. A bounding box will appear around your selection that you can drag, rotate or scale to your liking. Also the properties on the right hand side are still available on the right side for precise numerical input. Keep in mind that the numbers reflect the properties of the bounding box, not the individual slices!